We received a surprise in our mailbox last weekend. As part of a second grade school project, one of our friends colored a Flat Stanley and mailed him to our home. His arrival is pretty exciting. We're the first stop for her paper doll's adventure. That's him in the image above. (I hope he didn't mind getting scanned!) Don't you love the clothes and hair? If you've never heard of the Flat Stanley project before, the idea for this fun learning exercise comes from the children's book, Flat Stanley by Jeff Brown. By making and mailing their own Flat Stanley, kids can learn about interesting places around the world. Here's a little more about the character, according to the letter we received with our Flat Stanley -- "Stanley is a little boy who was flattened when a bulletin board fell on him. Once he was flattened paper thin, he went on many adventures. One adventure led him to climb into an envelope and mail himself to a friend in California!" Our friend's Flat Stanley is now on his way to the UK to visit Zoe and kids at Playing by the Book. Hope he has some wonderful adventures there. We haven't read the original book yet, but on our next trip to the library we plan to pick up a copy, probably the picture book version illustrated by Scott Nash. Virtual visit!!! - While we'd love to send a Flat Stanley to all of our blog friends, we can't afford the postage. However, if you are reading this post, Flat Stanley has just visited you virtually! Please leave a comment so that our second-grade friends in Wisconsin can see just how many people met this Flat Stanley (include your state or country in your comment, if you'd like, so they can talk about all the places he visited online). 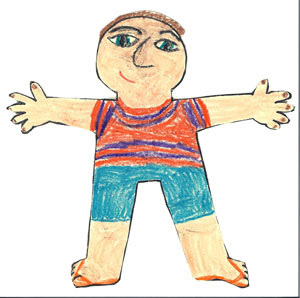 Have you or your kids ever participated in a Flat Stanley project? How fun. I have seen that before! Nice to meet you Flat Stan. My family lives in Ohio. Good luck on your adventures! My kids have never participated in a Flat Stanley project, but it sounds pretty cool! Have fun! Hi, Flat Stanley! You are virtually visiting me and my family in Beaver Falls, PA. Beaver Falls, is about an hour north of Pittsburgh. Pittsburgh is where Heinz ketchup is made. A few recognizable names from Beaver County: Joe Namath and Christina Aguilera. Have fun on your adventures! You chose a great family to visit, Stan! We're in Virginia and our own flat "E" visited her aunt last year. She had a great time, and I'm sure you will too! We haven't participated in a flat Stanley project before, but I know B would love it. We have made sure we take pictures of some of his favorite toys when they go on vacation with us! We're in California, so you can count a virtual visit here! Hi Flat Stanly from Montesano, WA. Montesano is a small town West of the Capital, Olympia WA close to the Pacific Ocean. We haven't participated in the Flat Stanley project, but have heard a lot about it. Have fun learning about all the different places Flat Stanley visits! Hi Flat Stanley! We are from Iowa. My little granddaughter just made a Flat Stanley a while back too. What fun they are! Flat Stanley, you have a great face! Hi Stanley! It's so nice to meet you! I hope you are having a nice visit in Blogland. We have hosted a Stanley. He mostly sat by my desk with the cat and kept me company while I wrote, but I did try to take him out to museums, theater, etc. He seemed to enjoy that. Stanley was a wonderful house guest. Hello Flat Stanley. You are visiting Dodgeville, Wisconsin. It is the county seat for Iowa County, Wisconsin and the home to the oldest courthouse still in use in Wisconsin. Also the home of Lands' End retailers. How Fun! "Hi" from Palatine, Illinois!! My first grader's class took Flat Stanley all around the world - whenever a parent in the class went on a trip, they would take Stanley with them and take a picture. Now that my children are grown and gone I'd completely forgotten about Flat Stanley. Glad to see they are still around and taking on new life. Great project. Well, we're not that exciting of a visit, LOL!! We've been on both ends of Flat Stanley--the kids always LOVE it. We can't wait for Flat Stanley to arrive here! I didn't know there were so many different versions of Flat Stanley - thanks for putting all this together. Hello Flat Stanley! Thanks for virtually visiting Cincinnati, Ohio!